Cats are naturally curious and love to explore. They can't resist jumping into an empty box, basket, or bag. They always find a way to keep themselves amused! Of course, felines like having a comfortable place to relax and nap, too. It's essential that these places are secure as kitties are vulnerable when they're asleep. Cats look for places to nap or hide where they can feel protected and watch what's going on around them. This is why some will lay in small boxes or a cat bed. Others on top of bookcases or cupboards. Still others under a bed or in a closet when it's naptime. Pet parents wanting to give their fur babies plenty of fun, safe options for playtime and naptime might consider purchasing specialized cat houses. Family pets that have beds or furniture inside the home will still wander around the yard, if allowed. Some kitties love having a place to go so they can watch what's going on in the neighborhood or to nap. Whether it's for inside or outside, there are several styles of cat homes from which to choose. All felines love cat furniture they can climb. Multi-level trees are an excellent way to keep kitty active and entertained for hours. A tree condo can have different features, depending on the manufacturer. Usually, however, they have a sturdy base with a ladder to upper levels. Wooden cat trees may have plush-style carpeting for additional comfort. Extra features may include multiple perches, hanging toys, and lookout towers. Wooden structures are usually much sturdier and more durable than those made from other materials. This might make them a bit more expensive than other pieces of furniture. But this also means that they will usually last longer. This alone makes them worth considering. Parents of rambunctious fur babies will also appreciate stronger structures that won't fall apart easily. Cottages made of higher quality wood materials, like cedar, are on the high end of the scale price-wise but are ideal for multiple animals. The cabins are quite simple to assemble and are often already insulated to keep pets comfortable regardless of the weather. These are quite sturdy like other kinds of wooden cat house. A cat can definitely feel secure here! Houses on platforms protect occupants from the elements. Loft-style homes give them a place to watch everything that's going on. This lookout can help pets avoid confrontations with other animals. Many models are available with an optional vinyl or plastic flap for the door to keep out rain and wind. These materials are also easy to clean. Win-win! Outdoor cat tree houses with a roof-top balcony are perfect to place in the yard or on the porch. 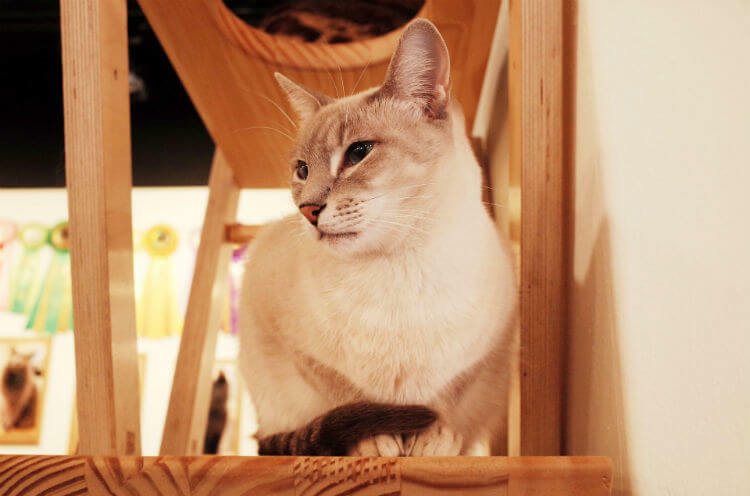 2 story houses have an interior space on the first level to set a cat bed. A multi story cat condo or tree with a deck provides felines with a place to sleep, play, and enjoy the outdoors. A large double-decker insulated cat house is an excellent solution for the parents of multiple fur babies. These apartments are spacious and give each animal her own space. This type of condo is meant for an outside animal. They often have asphalt roofs to protect them from rain. Plastic and vinyl are also common construction materials to waterproof these structures. What type of cat house is best will largely depend on where it will be placed: inside or outside. Some felines are inside-only pets, some are only outside, while others may roam wherever they please. Note that some authorities, like The American Society for the Prevention of Cruelty to Animals (ASPCA), recommend that cats stay indoors for their own safety. Manufacturers of pet products offer a diverse selection of houses for both indoor and outdoor pets. Basic designs are simple and reasonably priced. Some are large, with a lot of expensive bells and whistles. Animals all have unique personalities in the same way people do. Owners should choose the house that will be best suited to their specific pet's needs. One way to keep kitty happy and comfy is to provide her with a capsule that can double as a pet bed or as a place to play when the mesh door is removed. Put the door in place, and it becomes a carrier for trips to the vet. Many portable houses can be assembled in a matter of minutes and are also easy to store. This can make it easier to free up space quickly. These mobile homes often have doors on the front and the top. This allows felines plenty of ways to leap inside for added fun! These portable crates are often soft-sided to maximize comfort for both cats and small dogs. Pet owners should check that the front cover is held in place by a heavy-weight zipper. This zipper can prevent pets from escaping during travel. Another consideration is the material from which it is made. For example, tightly woven fabrics are a great idea as pets aren't inclined to chew on them. Tightly woven material is usually well ventilated as well. 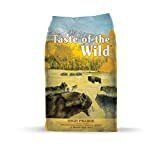 This helps animals stay cool even in the summer. 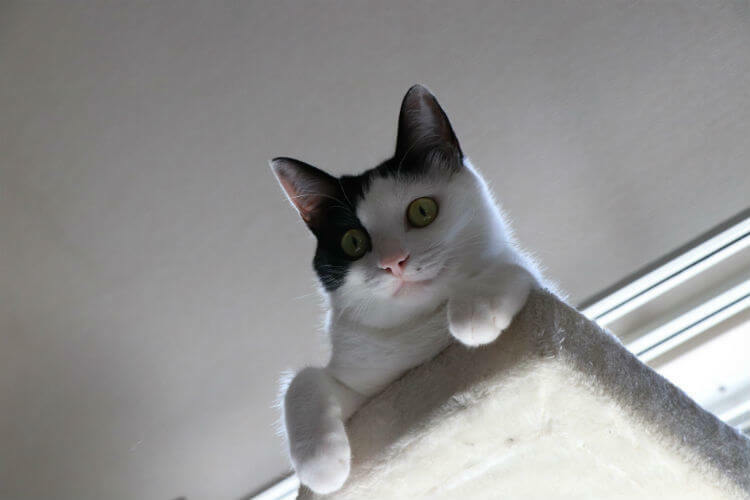 A standard cat condo is another suitable option for a house cat. Manufacturers make them from a wide variety of materials, including synthetic sheepskin and faux suede. The use of these materials can make cat condos both warm and soft. A soft condo is often easy to set up and fold away for storage. Some owners choose to let their lovable furballs spend time both indoors and outdoors. If the weather changes often, it's essential to have an outdoor shelter available that keeps animals cool in the summer and warm in the winter. Some felines like to be outdoors when it gets colder. They can be susceptible to hypothermia and frostbite when temperatures drop to lower digits. Just like people, pets need adequate shelter from the elements. If there are other kitties in the neighborhood that like to wander or feral toms around the house, providing shelter for them may be a consideration as well. A house for an outdoor cat may be simple or elaborate. They are usually designed to be warm in the winter and cool in the summer. Pet parents should look for weatherproof ones. These will stand up well under different types of conditions. Insulation is not always standard in these types of structures. Those looking to purchase an outdoor cat home should keep this fact in mind. When buying a house for kitty, owners should look for one that's easy to assemble and created from non-toxic materials. 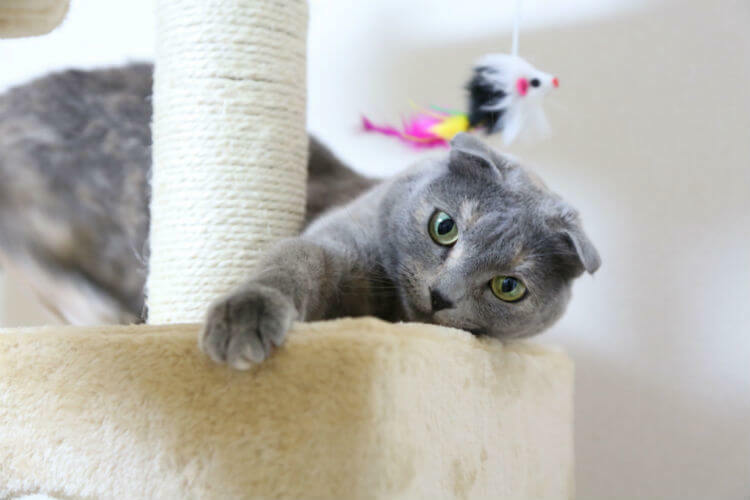 Indoor dwellings should be versatile so pets can lounge on the tower or cat perch, or retreat to the interior for a relaxing nap. Owners need to make sure that the house is large enough to accommodate an average-sized feline. If buying a house (rather than a small cat cube or condo that can double as a house), one with a raised, removable floor is something to consider. It offers a lot of air circulation and is easy to clean and maintain. A raised floor will also provide more protection and warmth if the air gets chilly. An indoor house that's constructed on more than one level offers a lot of places for a curious cat to explore. Those with hinged doors and closable windows can keep even the silliest furballs safe and secure. Pricing can vary considerably depending on added features. Some other considerations include a deck for lounging around on sunny days, overhang roofs to protect the space, and thermal-ply insulation for temperature control all-year round. Heated, energy-efficient pads are also available to add extra warmth. Some houses are designed with a cat hideaway door, which opens one side of the house; this makes it easy to clean. Owners will probably need to look and shop around before deciding on something that works for them. Feeding stations are available in an array of sizes for one or multiple animals. Feeding bowls are placed on a raised platform. Oftentimes they come with a roof. One with a wide overhang will keep the dishes (and food) dry, so occupants can eat whenever the mood suits them. 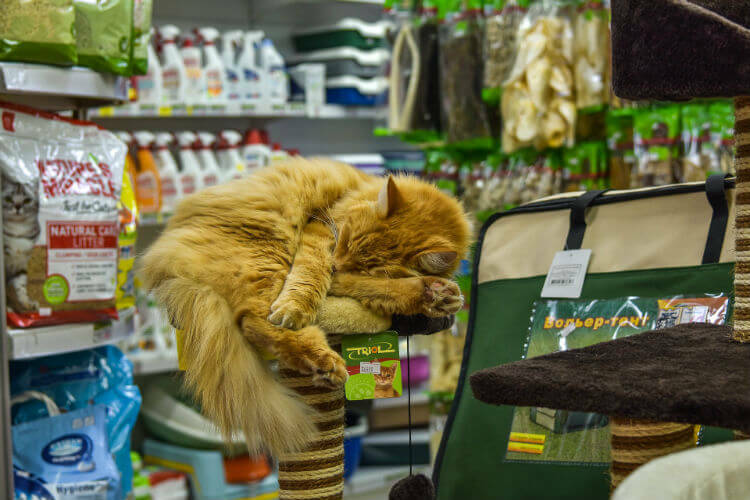 While heated outdoor cat houses are available, a removable heating pad is another excellent idea for the owner who allows a pet outside all year. This pad can keep an enclosure warm and comfortable. It can then transition to an unheated shelter in the warm weather. Heated beds are another cozy way to keep pets warm on even the coldest days. All pet parents want to provide the best life possible for their kitties. This includes giving them the best food, toys, and houses. 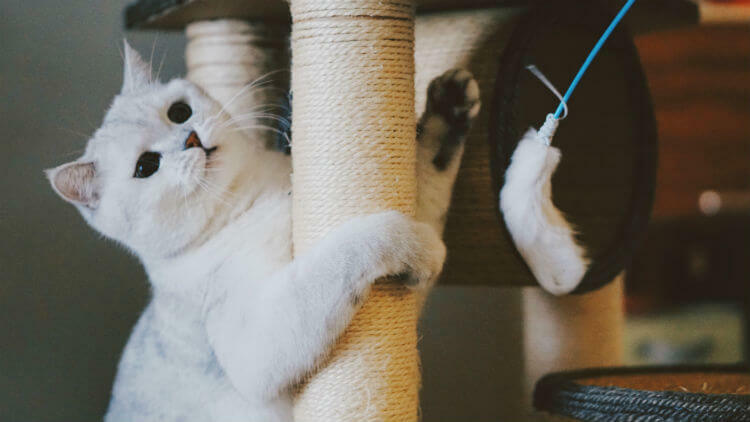 There's a lot to consider when buying a cat house: the number of animals, whether the structure is for inside or outside the home, pricing, and added features. Fortunately, owners have plenty of quality options available so they can provide the best possible care for their fur babies. With this handy guide, hopefully the next trip to the pet shop can be stress free! Disclaimer: This article has been neither reviewed nor endorsed by the American Society for the Prevention of Cruelty to Animals (ASPCA) nor Pets WebMD.